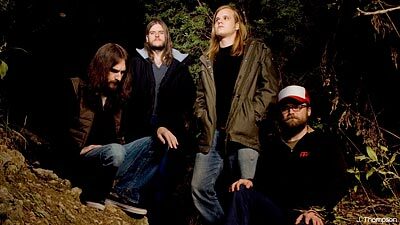 Right now, somewhere in Austin, Texas, the Sword is molding new stoner doom metal material they're hoping to record sometime this winter for release sometime in the spring of 2010. The follow-up to the band's epic second opus, 2008's 'Gods of the Earth,' is being tweaked and fine-tuned, and Sword mastermind J.D. Cronise says the unheard stuff' is different from the group's last record or even the band's groundbreaking debut 'Age of Winters,' one of the 2006's finest offerings. "As the lyricist, coming up with eight or nine or 10 different themes every couple years, well, it's a little daunting some times, especially for me personally," Cronise tells Noisecreep about the change in lyrical themes on the next LP. "Given the types of themes we'd covered already, I didn't really want to revisit the same stuff again on another record and talk about the same things and doom and gloom and sorcerers and ravens and things. So, we just kind of wanted to change it up and do something a little different." Instead of riffing and raging about the sort of stuff that makes Dungeons and Dragons fanatics geek out, Cronise and the Sword are going sci-fi on album number three. But he has an extremely hard time explaining just what, exactly, the concept of the record is. "It's been hard enough for me to just sit down and explain it to my fellow bandmates and friends, so to explain it now would take an incredibly long time and be incredibly confusing, so I wont try to do that," Cronise says. "It's based on a lot of influences; a lot of surrealist French comic books and science fiction. 'Dune' is a big influence on me, and it kind of has some western themes as well. "It's psychedelic, in a way," he continues. "It's not like 'Star Wars' science fiction ... lasers guns and action all the time. It's more cerebral in that it's still mythological in the way it's told. It's science fiction and there's spaceships and robots, but it doesn't take place in the future. It's just like another planet far away sort of thing. Otherworldly. And of course, it will have universal-type themes in it. I wanted to create a completely original kind of setting to have the songs take place in." Cronise says it was important for the Sword to change things up a bit because they needed to challenge themselves and their fans. They need to venture out, diversify, and the singer and guitarist is proud of what they've come up with. "Most bands find what works for them, and then they do the same record over and over again," he says. "For me, it's weird. I can't keep yelling about doom and gloom. Those songs are written. They're in the set. Now, we need new stuff that sends a different message."